1. The colors are extraordinarily vibrant and the depth of the coating gives photos a luminous quality that no paper print can achieve. The best reason to buy a Magna Chrome print is for the incredible look. As Jeff Murray says, "Everything looks better on metal". 2. Because the image is infused into and not onto the special coating, the prints have an archival value and durability without the need for a protective glass. In fact, Magna Chrome prints are not only scratch-resistant, they are also waterproof. This makes them ideal for hanging in bathrooms, kitchens and other areas where paper prints would be susceptible to water damage. Displaying without glass has several advantages: viewing images is more intimate; there is no possibility of breaking the glass during shipment or while on display; glare is reduced. 3. The rigidity of the metal plates allows for several unique and contemporary hanging methods that would be impossible with a paper print. A Magna Chrome print has an ultra-modern look. 4. 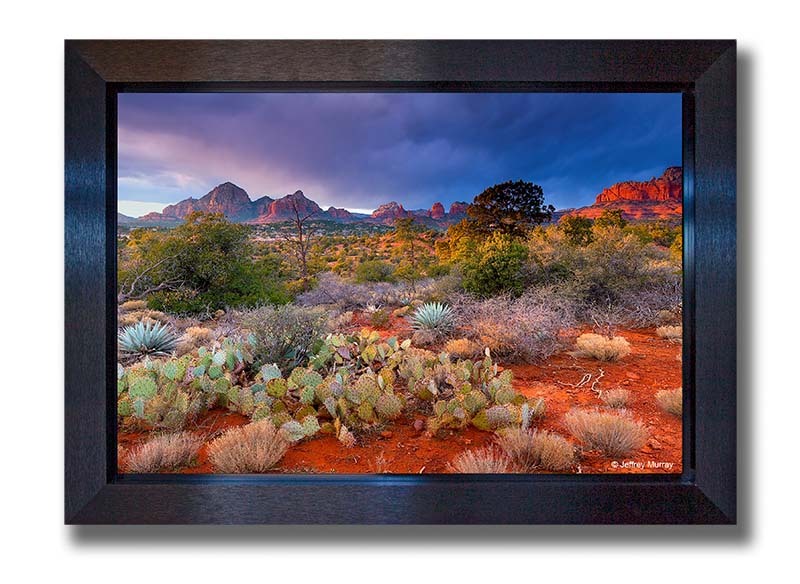 Economy: A conventionally framed print with matting, frame and protective glass will cost over twice the price of a similarly sized Magna Chrome print complete with a contemporary frame. Why is a Magna Chrome print so luminous? The old masters like Rembrandt built their paintings with many translucent layers of ink. This is why a Rembrandt is like no other painting. The multi-dimensional effect achieved by layering, gave a unique luminosity to their work. The same is true of a Magna Chrome print. Special dyes are infused into a thick translucent coating. The image is not printed onto the surface, but rather has a depth that in effect glows. People that see a metal print for the first time, often think that the print is backlit. Images printed with the Magna Chrome process will last for generations when displayed indoors and out of direct sunlight. Magna Chrome uses only ChromaLuxe metal and the longest lasting sublimation inks. Like any fine art print, Magna Chrome prints should not be exposed to direct sunlight . However, they can be hung outdoors if they are out of direct sunlight. Metal prints have an archival value that is better than the best giclee’s and photographic papers. Rochester Institute of Technology has conducted accelerated aging tests on metal prints and show an archival value of 2 to 4 times the image stability of traditional silver based photo papers. In addition to RIT testing, another highly respected testing facility, Wilhelm Imaging Research has substantiated the superior archival characteristics of ChromaLuxe metal prints. Plus, Magna Chrome prints have an additional benefit over other processes in that they are waterproof and have an ultra-hard coating that is virtually scratch proof. The archival value of a print should be judged not only by its resistance to degradation by U.V. light and ozone exposure, but also to moisture and surface damage. When these factors are brought into the equation, Magna Chrome prints would be, without a doubt, the best way to preserve an image. Actually, images are not printed onto the metal. Special dyes are printed onto a transfer paper and then infused into a polymer coating using high pressure and heat. Magna Chrome has been a leading innovator of this unique new process and manufactures equipment used in the creation of metal prints, such as our Transfer Pro heat press. What is the turnaround time for a Magna Chrome print? Most prints are shipped within 5 days of receiving the files (weekends and holidays not included). Framed prints take one exta day. If you need a print faster, please tell us your needs and we will do our best to accommodate. How do I send a photo to be imaged onto a Magna Chrome plate? We work only from digital files, preferably from images saved in the TIFF or JPEG formats. We do not offer a scanning service for paper prints. Preferred resolution is between 240 - 300 PPI in the Adobe 1998 Color Space, but if you are using a different color space do not change it - we'll do it for you. Digital files can be uploaded to us by clicking on the following link ( FTP link ) and then browsing your computer for the images you wish to send us. Unlike emailing an image as an attachment, our FTP link is not limited to small file sizes. Files up to 2 GB can be sent to us. Also it is much faster to upload through this method than through your email provider. If you prefer, send your files on a USB key. If you are placing an order online you can bypass the FTP link and upload your image as you order. Note: Sizes vary by +/- 1/8" . If you specify that you need an exact size, we will do all we can to hold a tight cutting tolerance. Because we use a metal shear to finish the edges, thin black lines that are less than 1/4" on the edges are not recommended.